Independent Integrity Inspection Limited (INDEi) offers a wide range of innovative of Non Destructive Testing (NDT) and inspection methods for food and drink processing equipment to help identify and prevent microbial hazards in everyday consumer products. Our inspection methods are proven over the past 17 years with highly trained and experienced technicians bringing together a combination of key skills and equipment to create unique partnerships with our clients. Our inspection methods are applicable for plate, tubular, duo-plates, brazed heat exchangers, pasteurisers, tanks, vats, silos, pipes, spray dryer chambers, fluid bed dryers, cyclones, bag filter housings enabling the confidence and prolonging the lifetime of the equipment under examination. The food manufacturing and beverage production industry is a complex, global collective of diverse businesses that supply most of the food consumed by the world population. The food and drink manufacturing industry comprises over 30 different industries. These include slaughterhouses, meat, poultry and fish processing, grain mills, maltings, bakeries, sugar confectionery, fruit and vegetable processing, oils and fats, margarine and edible oils, pasta, baby foods and dairies. Drinks manufacture includes production of soft drinks, beer and cider production, wines, spirits and and whisky distilling. They directly touch the lives of every consumer from the moment they are born to the final day of their existence. The introduction of laws, directives and standards such as ISO 22000, IFS (The IFS Food Standard is a GFSI (Global Food Safety Initiative) recognised standard for auditing food manufacturers. The focus is on food safety and the quality of processes and products) or BRC (The British Retail Consortium (BRC) is the leading trade association for UK retailing. Although the BRC food safety standard began in the UK, it is now recognised as a global standard. There are over 17,000 BRC certified sites worldwide, and a large network of BRC certification bodies in 90 countries) require all companies manufacturing food and beverages products to make their manufacturing processes transparent and as safe as possible. The possibilities for contamination from plate, tubular and SSHE heat exchangers, pasteurisers, process tanks, vessels and silos are endless. A regular preventative maintenance programme instigated by the producer will enable the risk to the consumer to be reduced and with regular inspection and testing of the Critical Control Points will ensure compliance to the regulations and safety in the knowledge that product brand name and consumer safety will be regarded in a high position within society. Leading food and beverage manufacturers rely on qualified and well equipped INDEI technicians to provide a professional service. We as a Company ensure process plant inspection and testing requirements are achieved efficiently and cost effectively. We combine our knowledge of food and beverage regulations and applications with the innovative range of testing equipment and experienced professionals to provide high-value products and tailored inspection solutions that meets your needs. We support the manufacturer in determining the best solution for cost-efficiently maintaining production, quality and regulatory requirements. 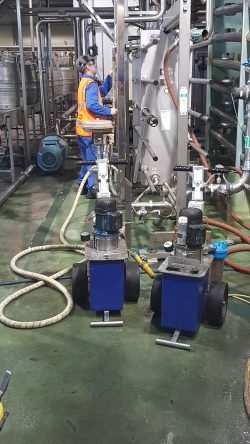 We are the one source for all of the inspection methods needed to meet your specific requirements for accurate and reliable results, hygienic, trace-ability and maintenance management, specialists in heat exchanger testing, pasteuriser inspection, tank, vat, vessel, silo inspection and spray dryer testing. ISO 9001 : 2015 registered quality management system. BSI certificate number FS 510584.